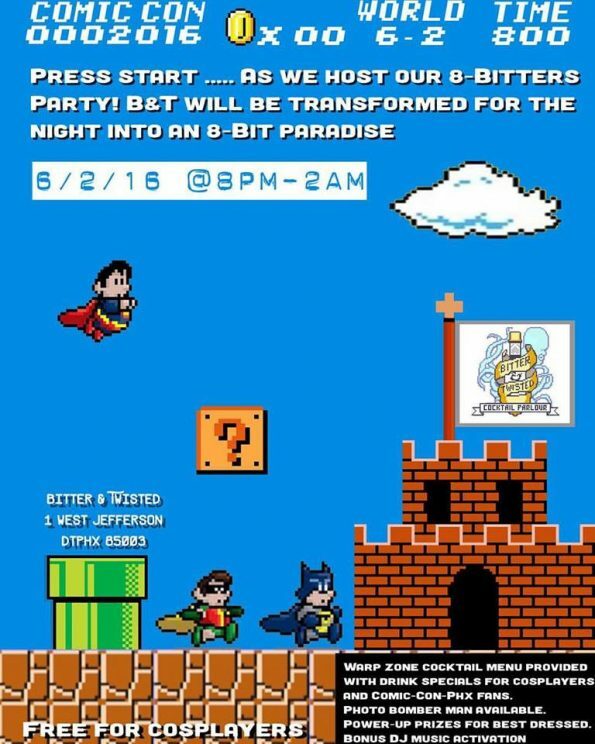 Calling all Phoenix Comicon fans, Bitter & Twisted Cocktail Parlour is being transformed in an 8-bit paradise and hosting a can’t-miss video game-themed “8-Bitters” party on Thursday June 2, 2016. Door will open at 8 pm to 2 am, pressing play on a custom ‘Warp zone cocktail menu,’ including special discounts for Comicon attendees or ‘cosplay’ guests (aka anyone dressed up as their favorite comic or video game character). There will even be ‘power-up’ prizes for the best cosplay. Plus, be sure to take a picture with the ‘photo bomber man,’ while enjoying live DJ music all night long. Please note that this is a 21+ event. Brimming with all-new menu sections and 21 innovative new cocktail creations, fear not Bitter & Twisted fans, because there are also plenty of returning favorites from the first two Book o’ Cocktails, such as theLime and the Coconut, and the Flawless Martini, the country’s coldest bottle blended martini in existence. So swing by on Thursday, June 2 and #DrinkBetter with the “8-Bitter” party and the new Book o’ Cocktails at Bitter & Twisted. When: The Bitter & Twisted “8-Bitter” party is Thursday, June 2, 2016 from 8 pm to 2 am.